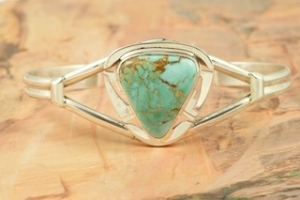 Genuine Dry Creek Turquoise set in Sterling Silver Bracelet. The Dry Creek mine is closed. It is now obtained from private collections. The Dry Creek Mine is located near Battle Mountain, Nevada. Dry Creek Turquoise forms when there are no heavy metals present such as copper or iron. To date, no other vein of this Turquoise has been discovered anywhere else other than the Dry Creek Mine and when this vein runs out, that will be the last of it. Because this Turquoise is as rare as the sacred buffalo, the Indians call it "Sacred Buffalo Turquoise". Created by Navajo Artist Phillip Sanchez. Signed by the artist. The turquoise stone is 7/8" x 1/2".